Back when I attended college in Southern California, tasty, cheap Mexican food was everywhere. In Seoul, 10,000km from Mexico, we are not as lucky. 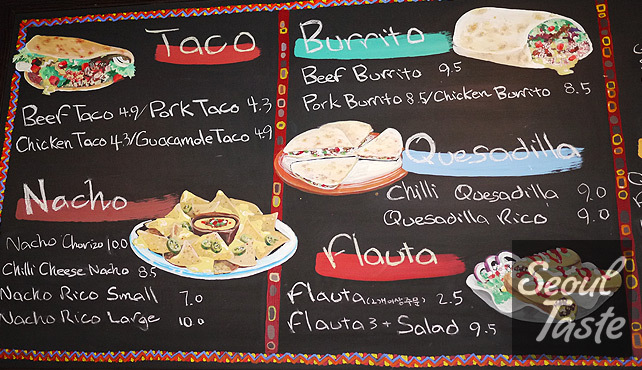 When you do find good Mexican fare, the prices take some getting used to! 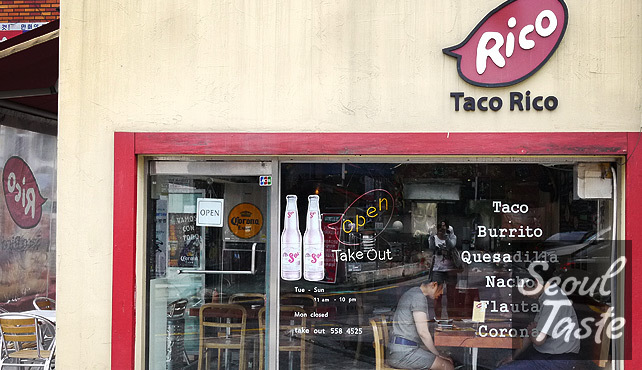 Still, when I need my taco fix, Taco Rico is it! It has been 10 years now since I last set foot in Mexico (in this case, San Felipe), but, like my first trip to Korea, I still have fond memories of eating until we could eat no more... then eating some more! 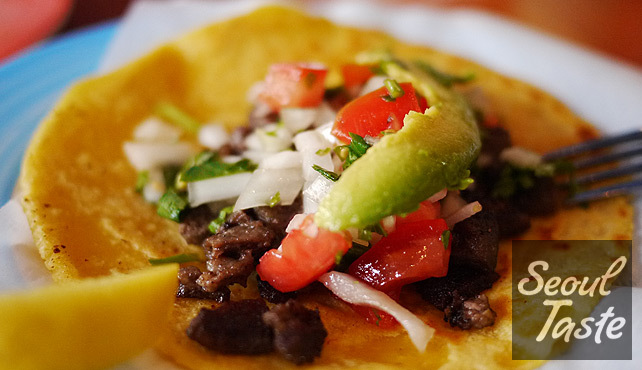 Of course, having lived in Southern California for four years, I also experienced a wide range of Mexican food there as well. After that, it was a little disappointing to move back to Honolulu, where the locals don't really have enough of a taste for Mexican food to keep the best restaurants in business. I figured the situation would be the same or worse when I moved to Seoul. Sure enough, for the most part, it has been Hawaii-quality Mexican with a 50% markup. No bueno. Until recently, the best I had found was Dos Tacos. It isn't bad, and at least the restaurant seems clean and the ingredients fresh, but there's definitely a sense that something's missing. The next step was finding Taco Man in Hongdae. The cut of meat wasn't quite right, but the spices were pretty close! Turns out Taco Man learned his craft in Mexico. I recommend giving him a try if you spot his cart. But for the full experience (con cerveza! 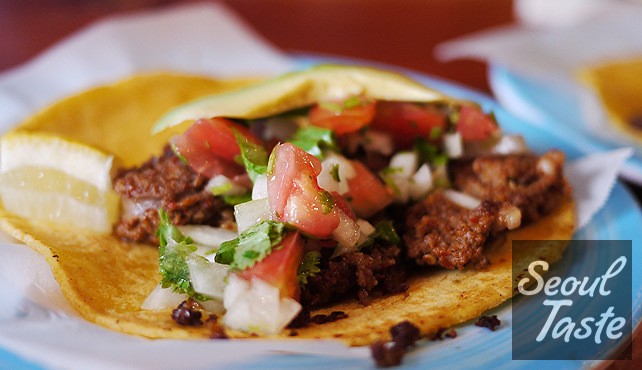 ), my present favorite is Taco Rico (as in, "delicious taco"). Curiously, the menu is mostly written in English. Where are the Spanish names? I enjoyed it immensely! Then I waited a few minutes. Unfortunately, at this price, I can't inhale these three at a time the way I'm used to! Here's the pork version, full of crispy little bits of blackened pork. 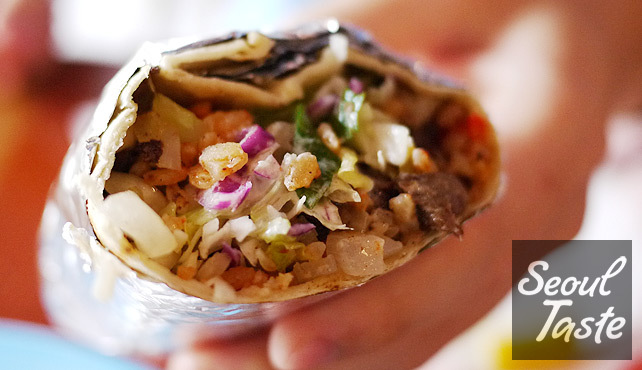 The burrito wasn't bad, but at a Mexican-Mexican place (vs. Taco Bell, Tex-Mex, etc. ), I simply prefer tacos. 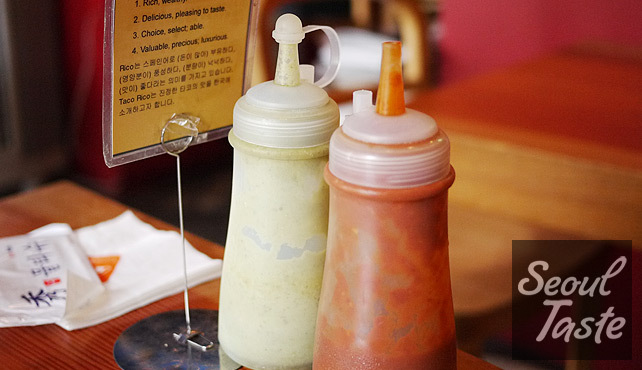 The second time we went, we had to ask for the salsa (maybe because we were one of the first few customers that day). So if they don't bring it at first, just ask. San Miguel? And where's the Tecate? Here's the beer selection. While I'm glad they don't serve Cass, that does mean every beer on the menu costs 7000원. Ah well, imported beer is expensive. What else is new? We tried two specials (not on the menu, but on posters on the walls, so they may not be there the next time). This taco, with handmade chorizo, had a bit too much cumin for Annie, but I liked it just fine. 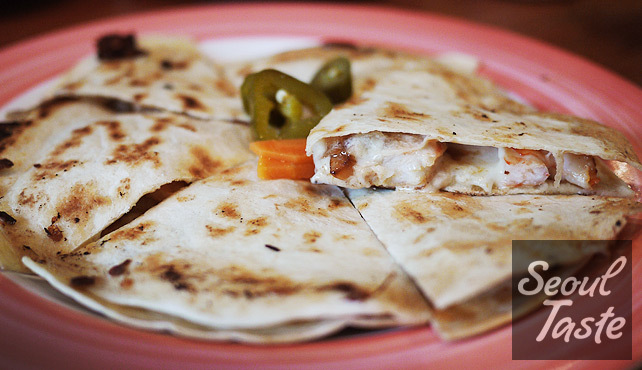 The shrimp quesadilla tasted fine, but if I order another quesadilla here, I think I will try a different one next time, maybe the Quesadilla Rico (Rica?). 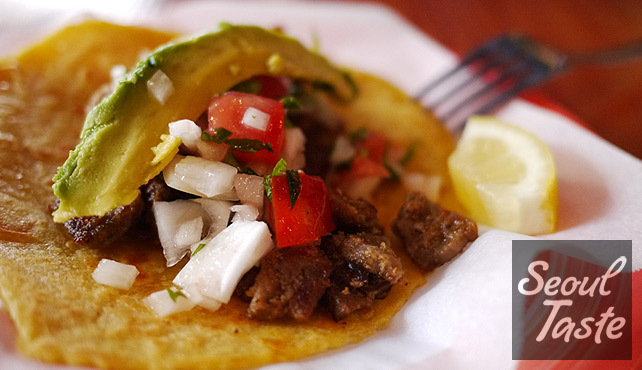 Overall, this review has been a little difficult to write because (1) I feel like it's been so long since I've had truly great Mexican food that I may well have forgotten what it's like, and (2) I have this nagging feeling that there must be more places out there that I haven't tried. So I really wanted to share this place with you all, but at the same time, I felt like I needed to add a disclaimer... so there it is. 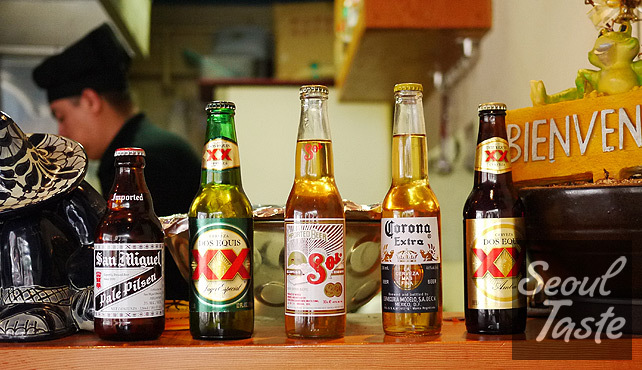 If you know of anyone serving up authentic Mexican fare in Seoul, please, please let me know in the comments! Food: 4/5 - Not perfect, but definitely the best I've found so far! Service: 3/5 - Nothing special. Atmosphere: 3/5 - Very small, kind of a 포장마차 feel, but not in a bad way (doesn't feel dirty or not fresh). Getting there: Take Line 2 to Gangnam, go out exit #7 (or #11 using the new numbers). Turn right at Paris Baguette, then go up the hill all the way to the end of the street. Turn right, and Taco Rico will be straight ahead. Curious about our review process?